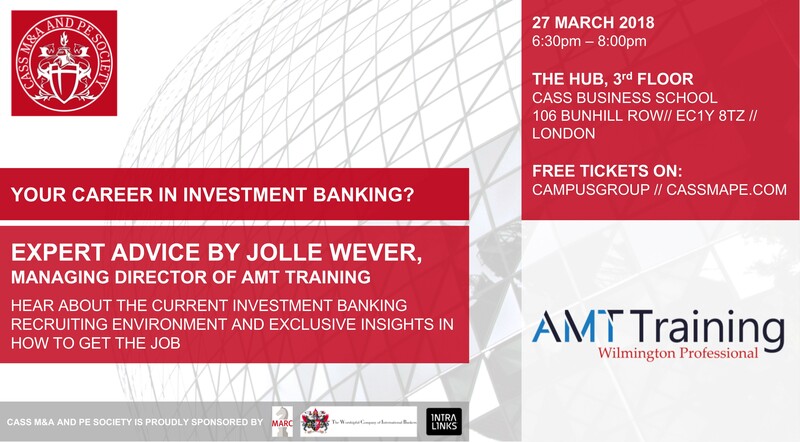 Cass M&A and PE Society is proud to host Jolle Wever, the Managing Director of AMT Training, who will give everyone interested in a career in Investment Banking exclusive insights and expert advice. Learn about Jolle’s Investment Banking experience at Kempen & Co and UBS Investment Bank as well as what AMT Training can offer you to get the desired job. Jolle Wever is the Managing Director of AMT Training and is responsible for its global strategy and operations. He joined AMT Training in 2015 following a career in investment banking. Mr Wever started his career at merchant bank Kempen & Co in Amsterdam, the Netherlands from 2002-2007, where he advised clients on M&A and capital markets transactions. In 2007 he joined UBS Investment Bank in London. Until mid-2015 he was part of UBS’s investment banking team, focusing on the Dutch market and financial institutions specifically. During his banking career Jolle has originated and executed numerous M&A and capital markets/financing transactions for a wide range of clients globally.